Lake Turawskie	Voivodeship	What is worth visiting? Turawskie Lakes complex includes a large reservoir and three smaller lakes. 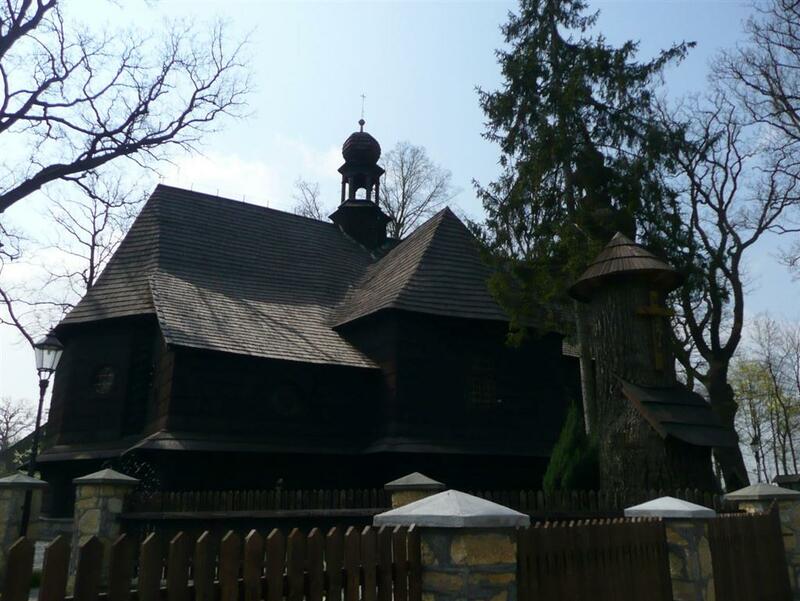 It is located approximately 20 km northeast from Opole in the area of ​​the villages of Turawa, Szczedrzyk and Kotórz. Turawskie Lake is a large artificial reservoir established in the interwar years on Mała Panew river for the supply of navigable water to the river Odra. Turawa reservoir covers an area of ​​about 20 km2, and its depth reaches 13m. Two smaller lakes, called Średnie and Małe, are located among the forests surrounding the main reservoir. These are old sandpits filled with water, from which material for construction of protective shafts around Lake Turawskie was derived. 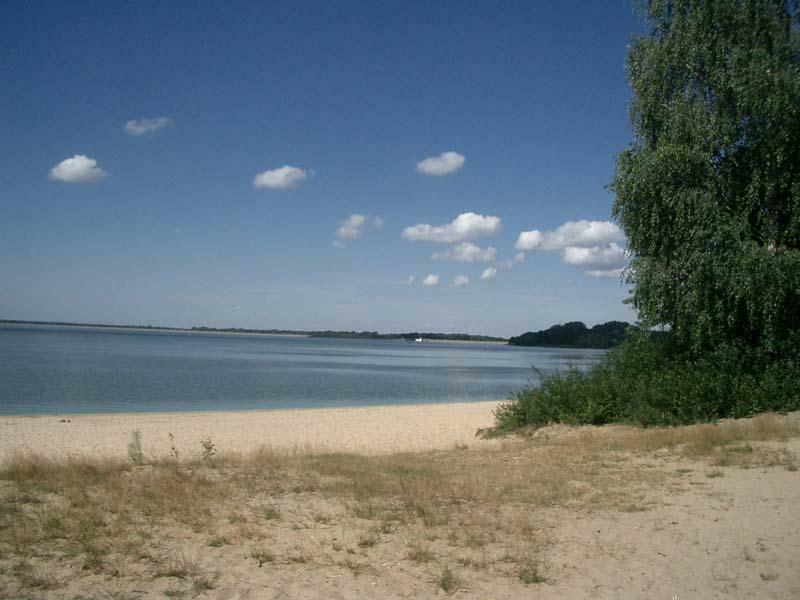 The third is a lake located in the vicinity of the village of Osowiec, called Zielone (Srebrne or Szmaragdowe). 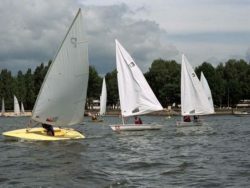 The large surface of the water surface of Lake Turawskie creates excellent conditions for sailing sports. 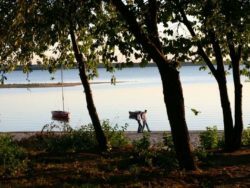 Extensive sandy beaches, picturesque secluded places surrounded by forest-rich pine forests are excellent recreational areas for the inhabitants of Opole and Upper Silesia. 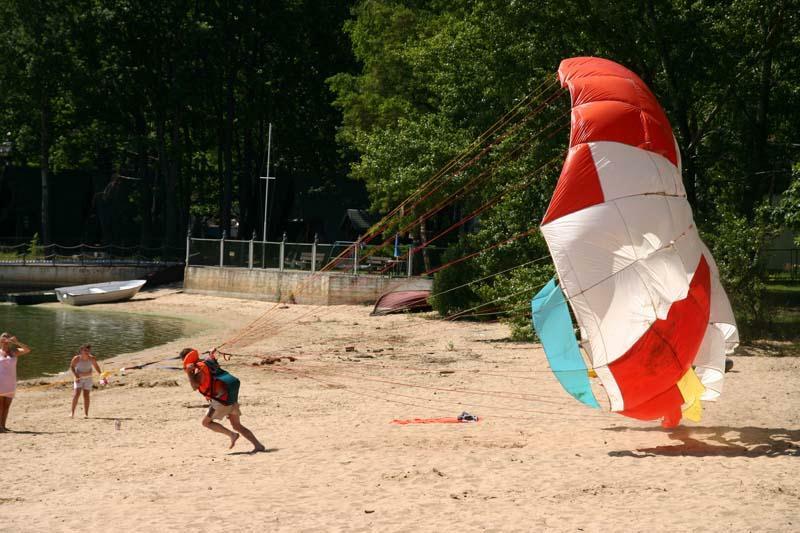 Numerous seasonal and all-year holiday resorts offering a wide range of services for individuals and groups have been created on the outskirts of the Lake. There is a well-developed network of nutritional points, tourist and sports equipment rentals, water reservoirs, and car parks. 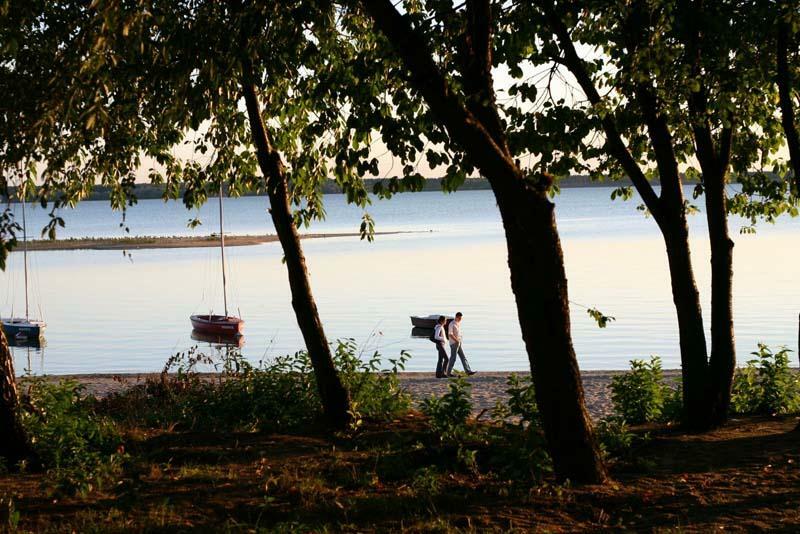 Turawskie Lakes are located in the warmest climatic regions of Poland. At the end of April the average temperature exceeds 10 ° C . The long summer lasts around 100 days and begins at the turn of May and June. The mild and long autumn lasts about 40 days and starts on the average around November 1. The coldest month of January is statistically average temperature of 1 ° C .
Winds from the west and the north-west in summer, as well as south and south-west in the winter dominate in this area. The wind speed is in 2 – 5 m / s.
The average annual precipitation is about 650 mm . The maximum daily rainfall totals occur in July (about 100 mm ), and minimal in February (about 40 mm ). On average, there are about 20 atmospheric storms per year. 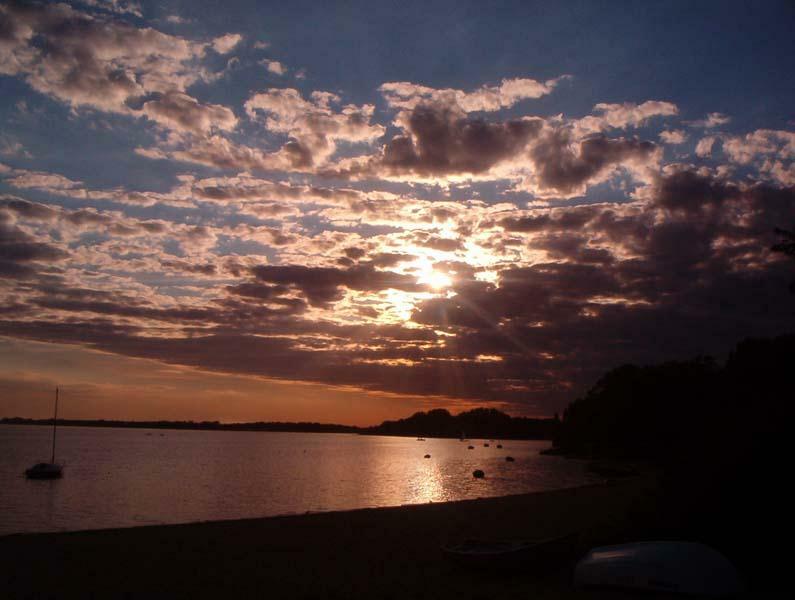 The average water temperature of a large lake is 16.8 ° C during the season. On average, in May 14.1 ° C ; in July 17.6 ° C ; in September 19.2 ° C.
Turawskie Lakes are located at the junction of a large forest complex known as the Stobrawsko-Turawskie Forests, which once formed Puszcza Śląska. Forest complexes adjacent to lakes occupy an area of 137 ha . It is dominated by pine stands with an admixture of birch, oak, spruce and less frequently larch, acacia and alder. Pine forests occupy a larger area of ​​areas around water reservoirs. The spruce layer is dominated by spruce. In the outflow between the dunes, there are boggy forests, mostly drained and overgrown with grasses. Turawski reservoir is in the Opole region one of the most important places of refuge and breeding grounds for many rare and protected bird species. It is also an important place for passing birds. The refuge of birds is primarily the eastern part of Lake Duże, areas of flood meadows and nearby forests. The total number of Anatidae occurring in this area during the flight period may reach up to 25,000 individuals. Freshwater fish farming is conducted on the territory of the lake. The water has been stocked since the very beginning of its existence. To this day, you can fish for pike, pikeperch, perch and eel. From the fish of calm prey, you can find bream, roach, carp and rope. The reservoir lake in Turawa was planned as a recreational area already during the plans phase. That is till today. 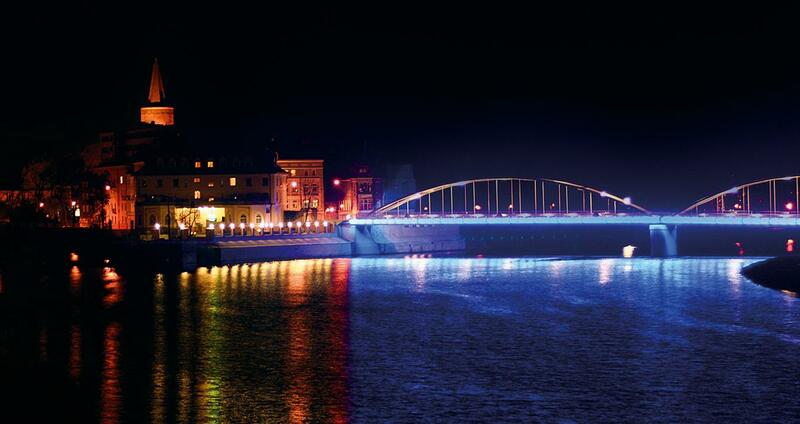 For the Opole region (and not only) these are areas for rest and recreation. Experts say that on the northern shore of the lake, there can be 23,000 – 25,000 people at the same time. On the southern shore, 15,000 – 17,000 people. There are about 50 company centers on the outskirts of Lake Turawskie. On the northern shore they have 2100 beds, and on the south there are 1700 places. Some of the resorts are open throughout the year, for example: Borowik, Pensjonat Zielony. On both banks there are two campsites for 1300 tents or caravans. On the outskirts in recent years, holiday development (200 houses on the north shore, 120 on the south) has been carried out. Holiday buildings are also being built in neighboring villages such as Marszałki, Rzędów and Niwki. The tourist and recreation base enables accommodation of 11,500 people at the same time. On the outskirts of the lake, there are also 4 restaurants, 2 private cafes, 16 cafes in holiday resorts, 4 shopping and gastronomy pavilions, and 32 other commercial outlets. 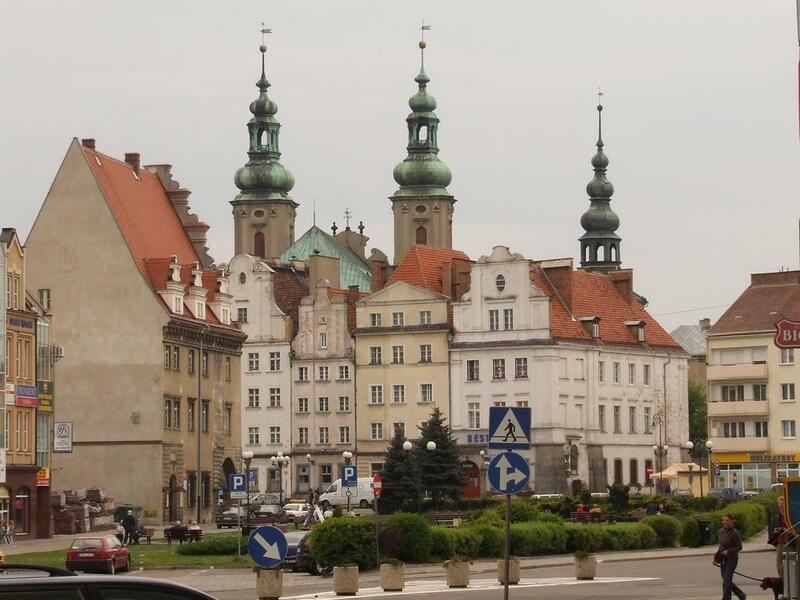 Opole region is a geographical region in southern Poland, it is also called the Opole Silesia. This land belongs to one of the youngest in our country – it was established in the 1920s thanks to Polish politicians. The vast majority of this area are those that once belonged to Silesia. Opole was the capital of the divided Upper Silesia from the Middle Ages until 1941, but during World War II, one capital was established and it was Katowice. During the period between the war and the Polish side, the name Opole Silesia was used, whereas the German side was East Upper Silesia. 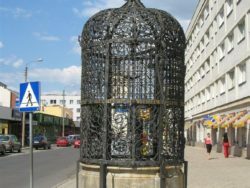 After the Second World War, the Opole region became entirely Polish and Opole became a separate capital of this region. This land is characterized by a great diversity – if in the west the landscapes are typically agricultural, the further to the east there are more factories. There are many nature reserves in the Opolskie Voivodeship. Among them, the Forest Nature Reserve “Przylesie”. The reserve protects a fragment of deciduous forests of natural origin, forming transitional forms from oak-hornbeams to alder forests and alder-ash forests. The 200-year old oak stand, which is unique on the national scale, looks particularly impressive. The reserve also has 7 species of protected plants. In the voivodship there are specific valleys of the Odra valley. Łęgi are forests in river valleys growing on mud and periodically flooded. Tree stands are species that eliminate periodic root sinking. There are mainly willow thickets composed of white willow, almond, purple and red willow, there is water vegetation in the irrigated areas, among others walnut. There are also extensive meadows. 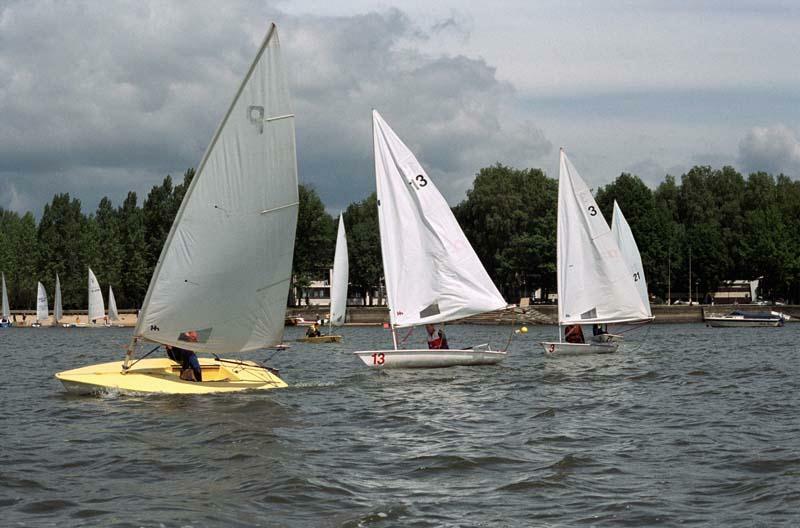 A great attraction are the Turawskie Lakes – a complex of four artificial lakes built to allow the regulation of the water level on the Odra River and for recreational and recreational purposes. 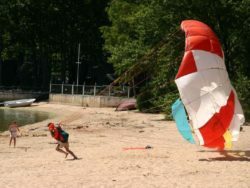 At the outflow from the lake operates a hydroelectric power plant and the northern and southern shores form beaches surrounded by pine forests with many recreation centers. This reservoir is also attractive for sailing and fishing. The Turawski reservoir is one of the three most important refuge for migrating birds in the Opole region. Within the borders of the Opolskie Voivodeship there is a small fragment of the Eastern Sudetes Mountains Opawskie. The highest culmination in Poland is Biskupia Kopa, it is also a tourist border crossing. These mountains, due to their isolated location, enjoy quite a lot of tourism. 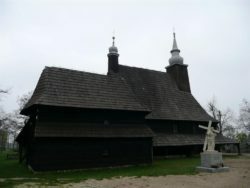 Among the places worth visiting in the province are: Kędzierzyn Koźle, Głuchołazy and St. Anna Mount. 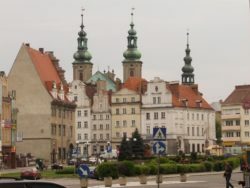 Kędzierzyn Koźle is the second largest city in the voivodship. 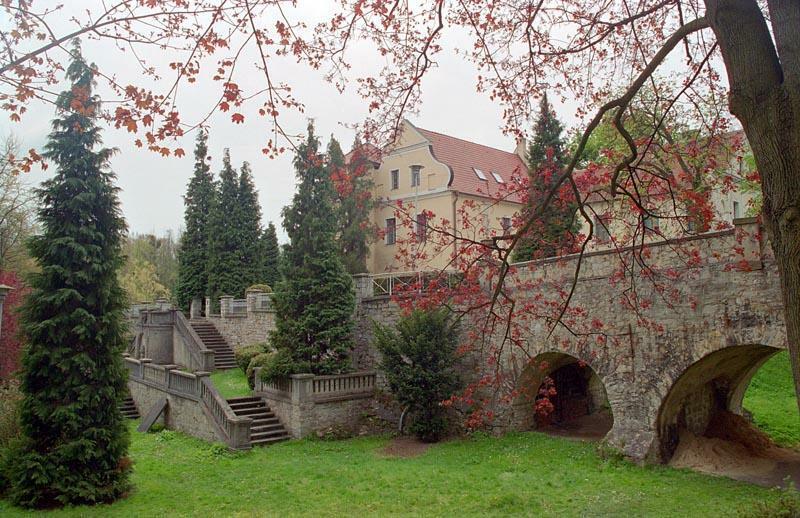 Here we can see fragments of the former fortifications of the Koźle fortress, the historic Kłodnicki Canal connecting Koźle with Gliwice, the park and palace complex in Sławięcice, the area of ​​the former concentration camp Sławięcice and monuments of industrial construction. 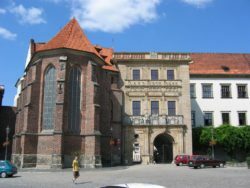 In Głuchołazy, according to sources in the past often visited by Lenin, the tourist attraction is the urban layout of the city from the 13th century, the town hall from 1522; remains of defensive walls. There are tourist and bicycle routes. St. Anna Mount. – is a village located on the top of Chełm ridge, and the highest elevation of the entire massif – 404 m above sea level. 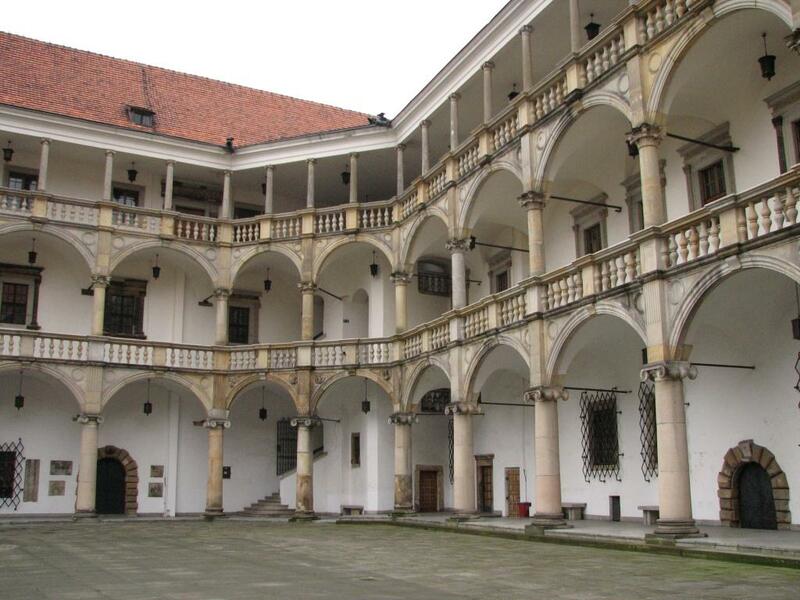 The dominant monastery complex of the Franciscans, consisting of the pilgrimage church of St. Anna, monastery, cloister courtyard, monumental stairs and extensive Calvary modeled on Kalwaria Zebrzydowska. 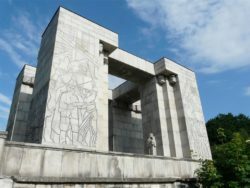 There is a monumental Monument to the Rising Act of 1953 which reminds us of the battles of the third Silesian uprising. At the foot of the monument stretches the largest rock amphitheater in Poland, built in 1934-1938 in the place of the former quarry. 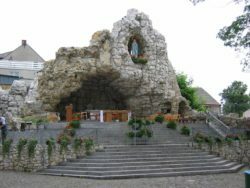 In June 2000, it was unveiled on the Holy Mount. Anna’s monument in honor of John Paul II. 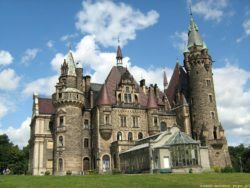 Opolskie has over 20,000 architectural monuments, almost 9,000 movable monuments, around 160 castles, palaces, manors, unique wooden religious architecture and medieval polychromes. It is a land of tolerance, different and how rich cultures, traditions and nationalities. They are silent and beautiful testimonies of past centuries, human fates, achievements, great plans enchanted in stone sculptures. It is also beautiful, clean nature: 3 landscape parks (St. Anne’s Mountain, Opawskie Mountains, Stobrawskie Forests), 34 reserves, 6 protected landscape areas. 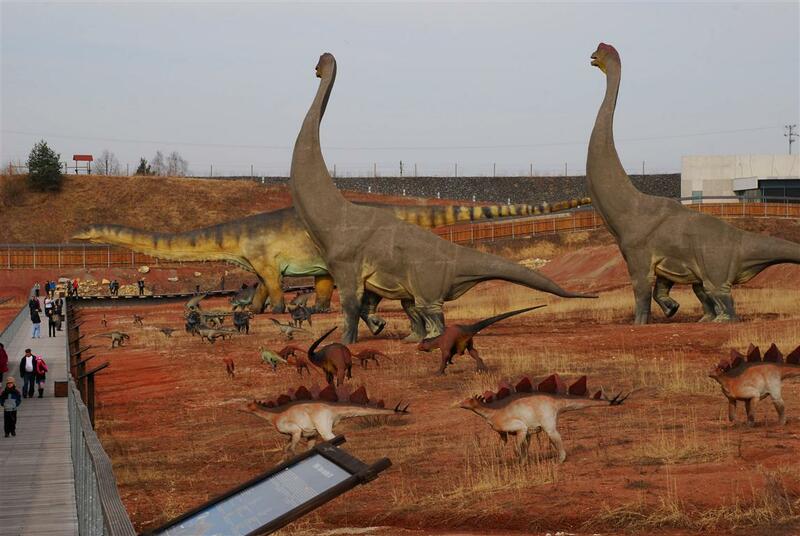 It is in the Opole region that paleontologists have found the skeleton of the oldest dinosaur in the world. 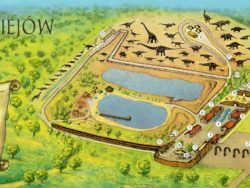 Soon, the biggest attraction of the region will become DINOPARK – the only place in the world where tourists will be observing and participating in excavations. 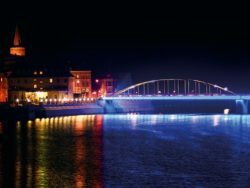 The provincial city of Opole can be the most attractive tourist destination at the end of May, when it becomes the Capital of Polish Song. 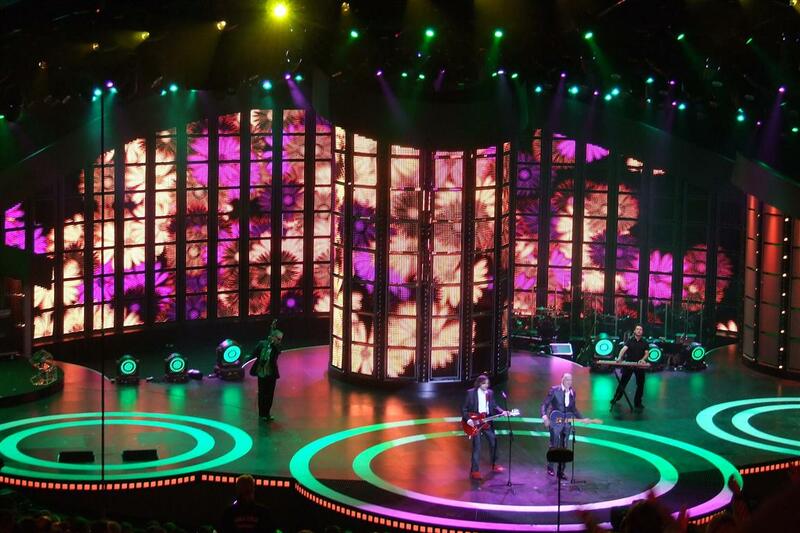 Whole Poland knows the distinctive Piast Tower and the image of the Opole amphitheater. A similar national song festival, older than Opole, is organized only in San Remo. Edyta Górniak, Michał Bajor, Pawet Kukiz are well-known in the entire country and they come from Opole region. Opole is also the arena of the Polish National Theater Confrontations “Polish Classics”, the National Festival of Puppet Theaters. 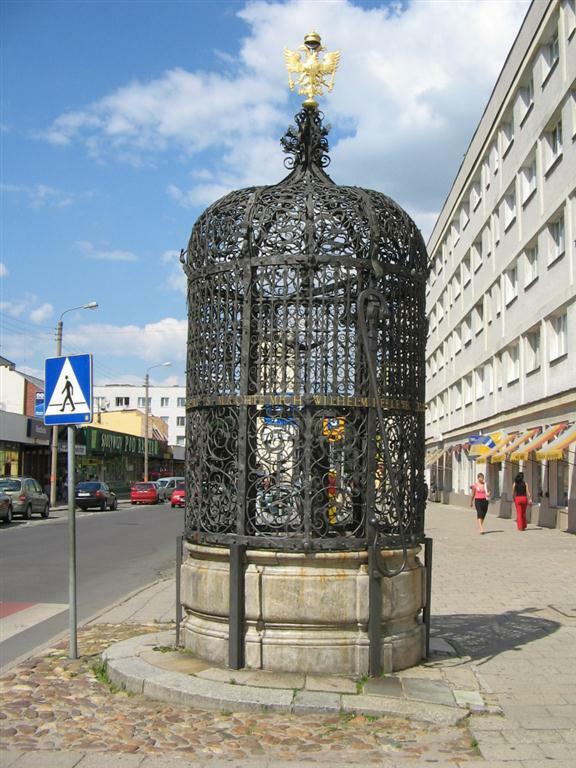 The historical-geographical character of the capital of the region is best reflected by the fountain “Opole Ceres” by Edmund Gomansky. The goddess of fertility and fertility (Demeter) is surrounded by mythological deities, symbolizing the pillars of the Opole industry: agriculture (Proserpine), rafting and shipping (Neptune, Glaucus) and the rock and cement industry (Hercules). The silhouette of the Renaissance town hall, built on the model of Florentine Pallacco Veccio, dominates the Opole market square. In tenement no. 4, in 1958, he started the activity of the world pond “Theater of the 13 Rows” by Jerzy Grotowski. 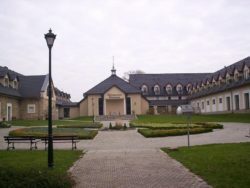 Pasieka of villas – located behind the Młynówka canal – is the cradle of the city. From the center, a green bridge leads to the island of Art Nouveau. 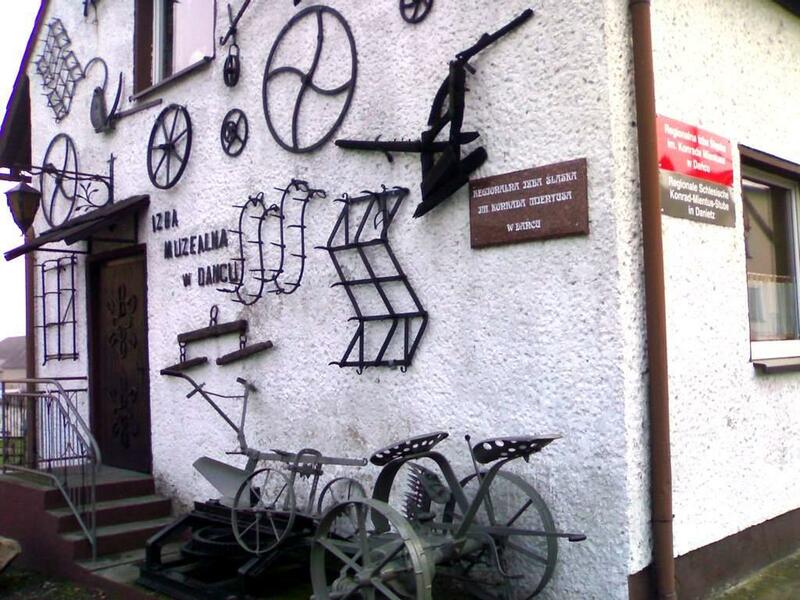 Beside, at the “Grabówka” pancakes, the reconstructed figures of the famous sculptor Thomas Myrtka draw the eye. 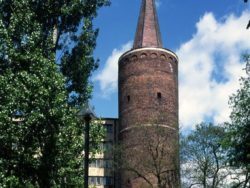 On the island, archaeologists have discovered “Ostrówek” – an early medieval stronghold of Opole, partially exposed in the Museum of Opole Silesia. 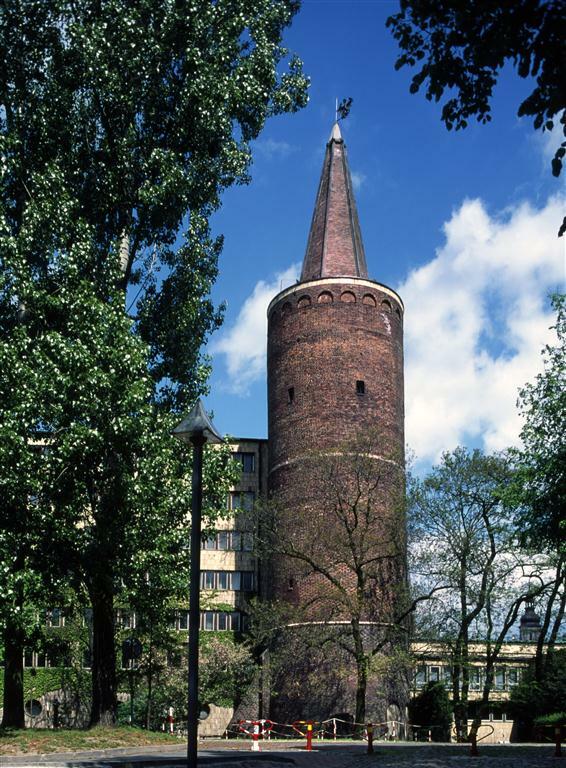 After the castle – the seat of the Opole Piasts, remained the symbolic Piast Tower, an architectural decoration of the Opole Voivodship Office. Młynówka is winding between Pasieka and the market square. After cleaning the canal and recreating walking paths along the “Opole Venice” to the river port on Bolko island, upon Młynówka gondolas and boats characteristic for this place are about to return. Near the amphitheater, at the former castle pond, stands the “Ice House”, once the seat of the Skating Society, founded in Opole in 1908. 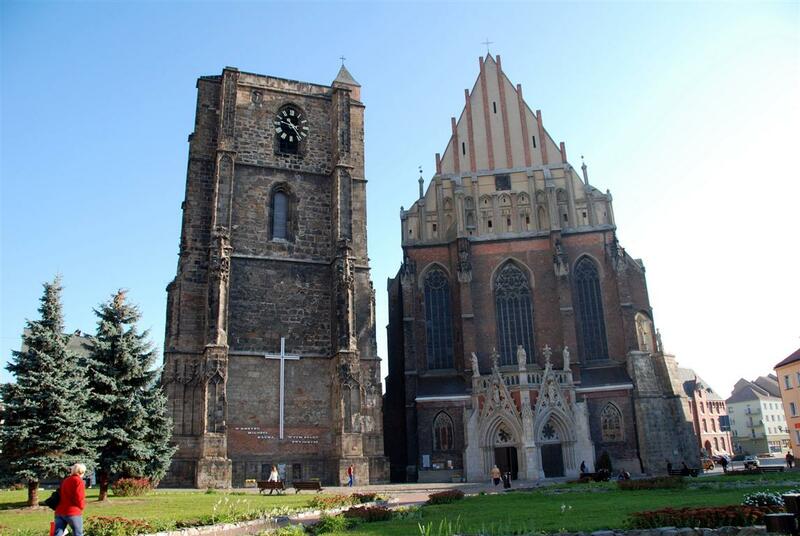 Above the city center there is a two-tower gothic cathedral with a miraculous painting of Our Lady of Opole and a tombstone of Jan II Dobry. In the Franciscan church, amazes the chapel of St. Anna – Mausoleum of the Piasts of Opole. In the basement lie the remains of the Piast princes. Near the Franciscan church, on Minorytów Street there was a house where the famous world traveler, physician, politician Emin Pasch (Eduard Schnitzer), Governor of Ekwatia, known from Sienkiewicz’s novel “In Desert and Wilderness”, was born. 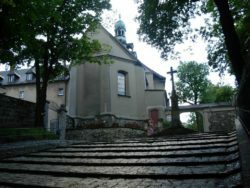 It is usually recommended in Opole itself to visit the Z00, to walk around the Bolko Island, see a panorama from the Piast Tower, visit historic churches: the cathedral, the Franciscan church, the church “On the Hill” or use the offer of theaters, cinemas, galleries and cultural centers. 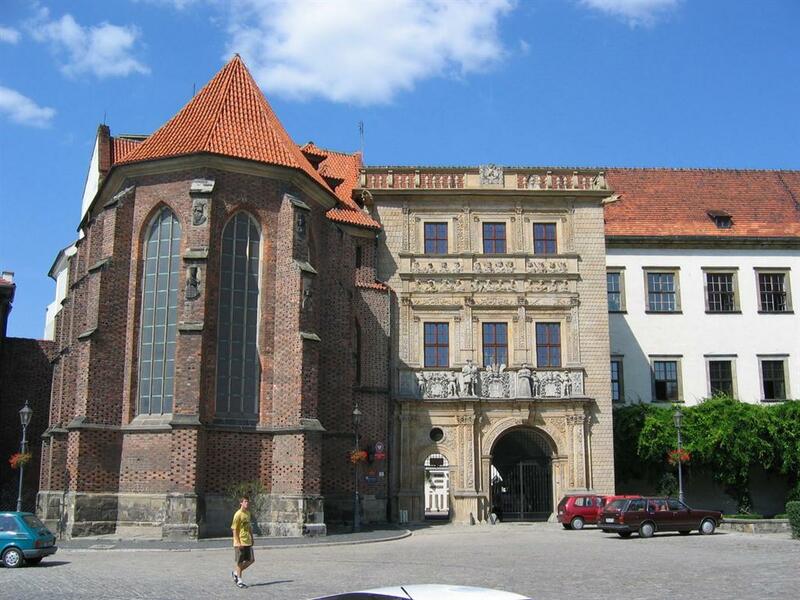 Interesting exhibitions are offered by Opole museums: the Opole Silesia Museum, the Diocesan Museum, the Jan Cybis Gallery, and Contemporary Art Gallery. The pride of the city is “Opole Acropolis” – the seat of the Opole University with a restored gallery of baroque sculpture on the slope and adjacent chapel of St. Wojciech. The chapel stands in the highest point of the city, on a limestone hill, in the place of the legendary stay of Saint. Wojciech in Opole. Architecturally interesting is the building of the main railway station with a wonderful acoustics, platforms built on the gaps and concealment structures in the style of Corinthian columns. Next to it – the post office, built clearly according to the Berlin architectural school Friedrich Schinkel. Known as the Silesian Wawel – erected on the site of a Gothic fortified castle. The present shape was given to it by the Renaissance reconstruction carried out by Italian architects – Jakub Parr, Franciszek Parr and Bernard Niuron. Destroyed during the siege of the city in 1741, rebuilt in 1966 – 1990. Preserved richly carved facade of the gate building is among the most renowned Renaissance monuments in Central Europe. 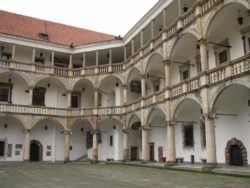 Courtyard with reconstructed three-story cloisters. On the ground floor of the east wing, part of the rooms is preserved. 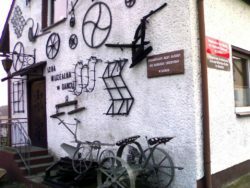 The building houses the Museum of Silesian Piasts. As part of the permanent exhibition, the museum presents the history of the city, the history of the Silesian Piasts, and Silesian sculpture and painting, from the 15th to the 18th centuries from the collections of the National Museum in Wrocław, including paintings by the most outstanding painter of the Silesian Baroque Michał Leopold Willmann. Museum collections include sarcophagi of the Legnica-Brzeski princes and the only preserved medieval hunting bow in Poland (XIV century), found during excavations on ul. 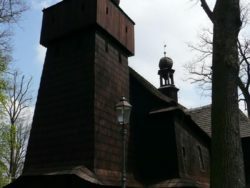 Dairy in Brzeg. 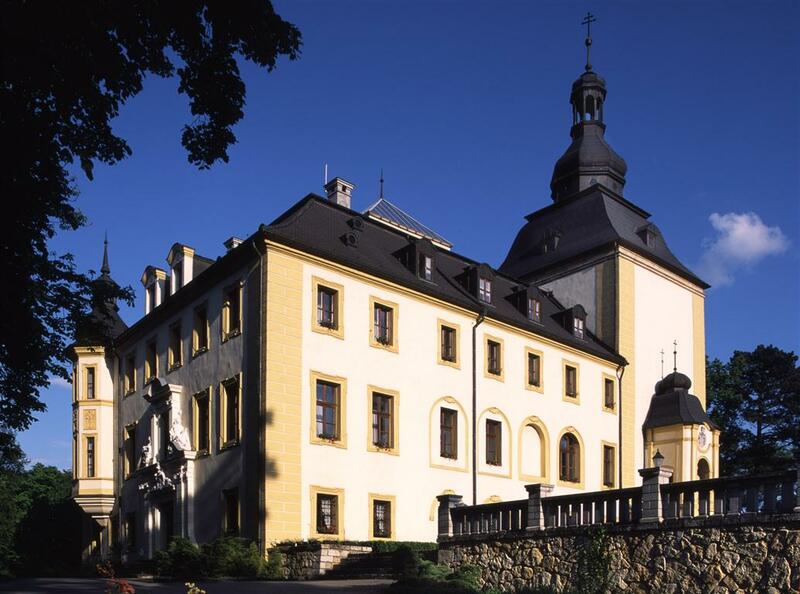 The complex of the Franciscan monastery from the 17th century includes: the Baroque church of St. Anna from 1657-1673, Rajski Plac – or the courtyard of the indulgence of 1768, as well as the monastery from 1665, rebuilt in the eighteenth century. 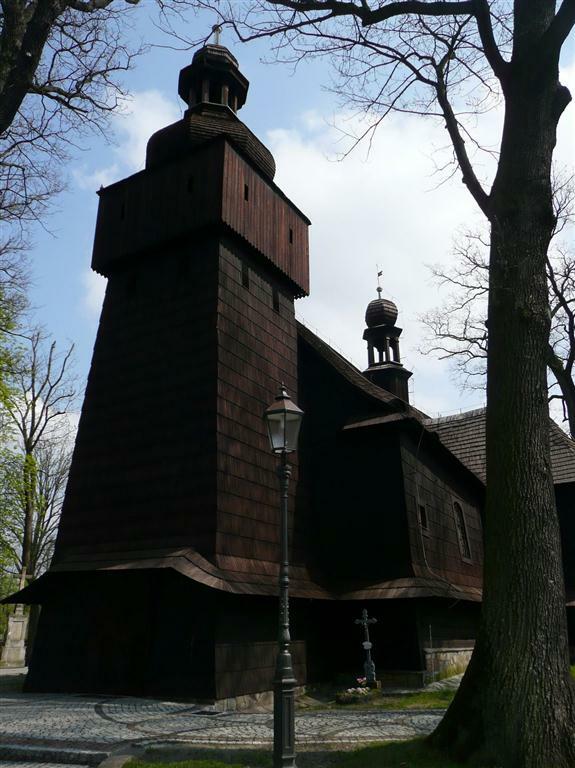 Wooden church of St. Jadwiga (1711) with valuable polychromy. 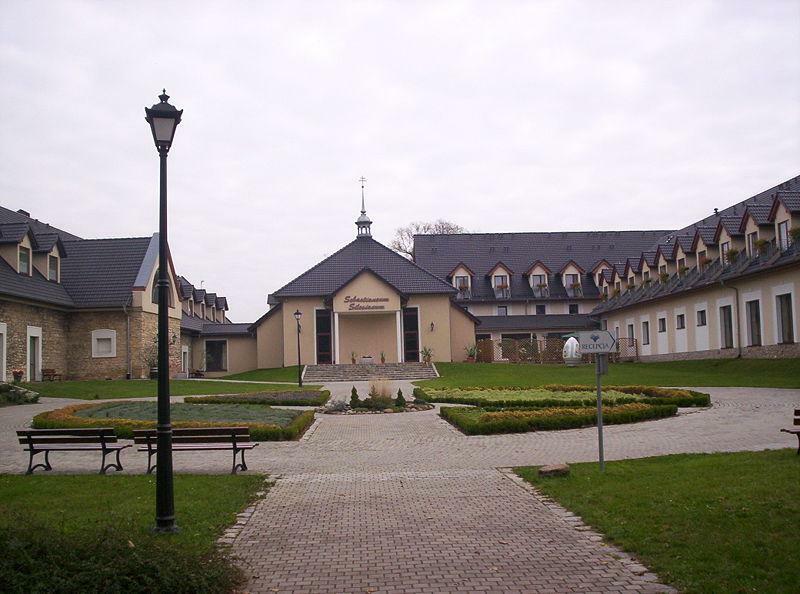 Regional chambers operate in many Silesian towns. This proves the respect of their inhabitants for the past. 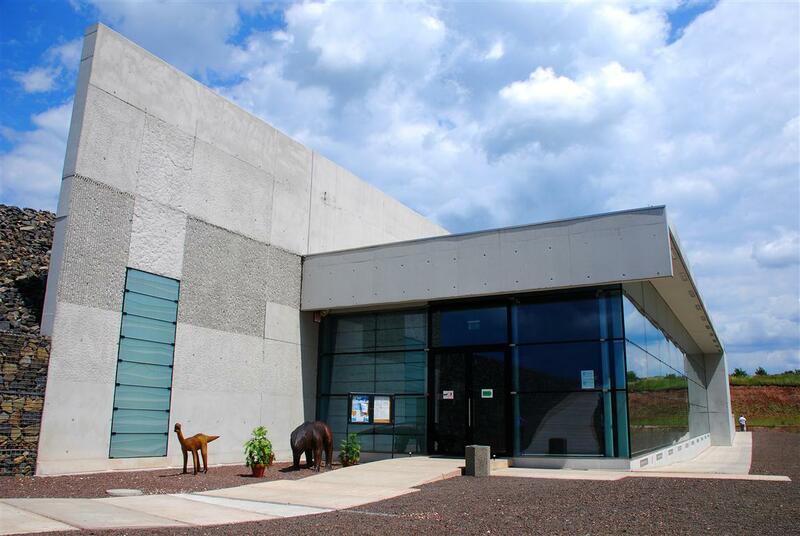 One of the best known is the Regional Chamber of Silesia Konrad Mientus in Daniec. It has been operating since 1978, run from the very beginning by Mr. Konrad. It is worth coming here and giving yourself a tour by the custodian who knows every exhibit. In addition to watching, one should also listen carefully to what Mr. Konrad has to say. The wisdom of an elderly man is shared with visitors, telling about life in the pre-war, German-Silesian, German, Polish and Silesian wartime, wartime, German and post-war dances. 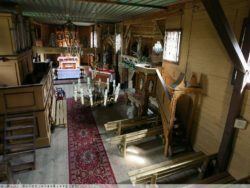 Sets of chambers are agricultural tools, home appliances, folk and mining costumes, musical instruments, old clocks, altars and crucifixes. Everything from the folk past, which, according to Mr. Konrad, deserved to be preserved for the future. 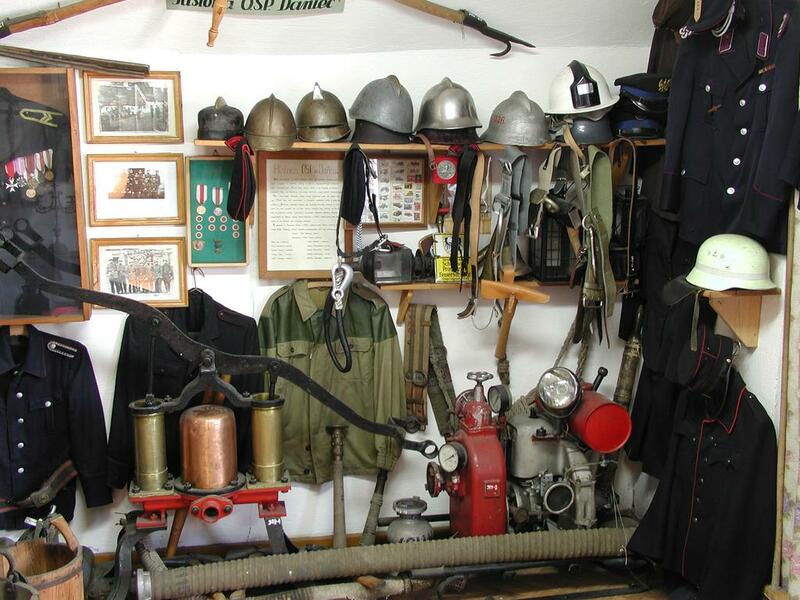 An interesting part of the exhibition are firefighting equipment, uniforms and firefighting helmets. The House in Daniec is unique due to the person of the devoted custodian. 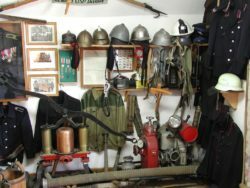 In a sense of duty, Mr. Konrad Mientus is always ready to make his collections available to tourists. It is enough to make an appointment by phone (tel. 077 421 94 94). 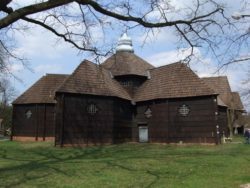 The oldest part of the wooden church of St. Anna in Olesno comes from the beginning of the 16th century. 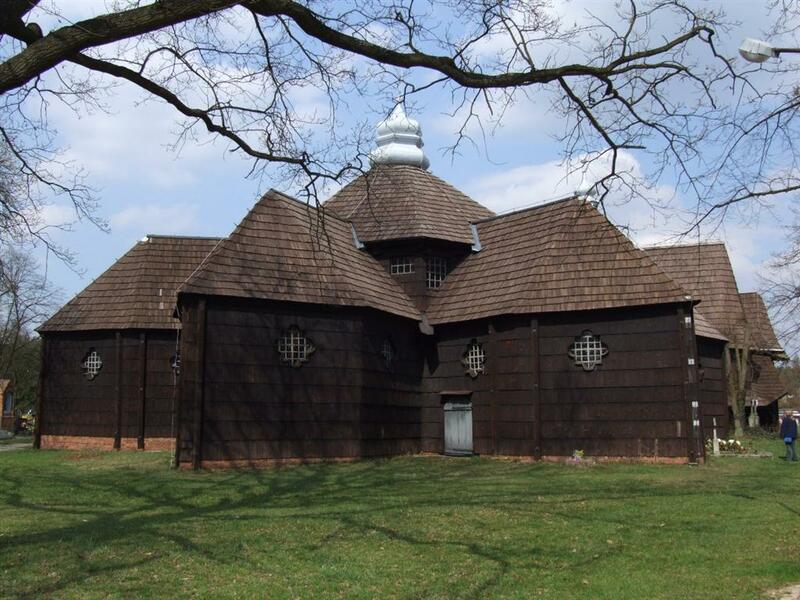 When in 1668, the local parish decided to enlarge the temple, they chose a rare architectural solution. A new church, on an unusual plan with a central nave and five radial adjoining chapels, was built next to the old one. Both parts were connected by a corridor, thanks to which there was an unprecedented form of the building, which can be compared to a rose – five chapels are petals, and the aforementioned corridor is a stem. The association with a rose is justified because the flower is in the coat of arms of Olesno (it is also compared to the star). In the older part of the church there is a very interesting altar. The original one, from 1517, was made by master Jan, one of Wit Stwosz’s students. It presents the Great Holy Family. Unfortunately, this is only a great copy made a few years ago by prof. Gerard Koch. The original, stolen in 1994, was cut into pieces by thieves and sold in such a form at the flea market. Two original sculptures from the altar, found by the police, can be seen in the Diocesan Museum in Opole. The church is located 2 km north of the city, in the cemetery. 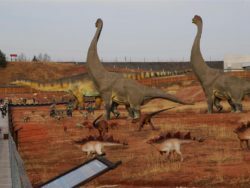 KRASIEJÓW – POLAND HAS ITS DINOSAUR! It was about 1.5 m long, was a small four-legged herbivore and lived about 225 million years ago. His remains were found by Polish paleontologists during excavations in Krasiejów. Opole’s prasaurian belongs to the oldest in the world and – as it turned out – nowhere else was found this type of dinosaur outside of Poland. Professor Jerzy Dzik, under whose direction the excavations are conducted, gave him in honor of the region the name Silesaurus opolensis. An extremely valuable discovery was made in the open-cast mine of clays belonging to the “Opole” cement plant. The place turned out to be one of the world’s richest Triassic sites of vertebrates. Paleontologists have found, apart from silyzaur, fossil remains of phytosaurus, metoposaurus, aetosaurus and teratosaurs. Found fragments of skeletons occur in large clusters, often containing mixed up remains of various species of dinosaurs. Scholars believe that this real cemetery was created in the mouth of the former river, whose waters were carried with the mainstream of dead individuals and deposited in a vast basin or bay of the Triassic Sea. Reconstructed dinosaurs can be seen at the Warsaw Museum of Evolution. 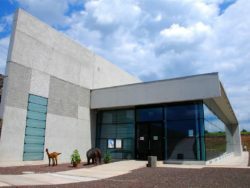 A very modern steel and glass pavilion was opened in Krasiejów on the site of the now closed mine, which initiated the functioning of the Dinopark. Inside it, palaeontologists working on the find and the visitors following them can work at the same time. Thanks to the glass floor and a fragment of the exposed position, you can watch dinosaur skeletons! The screenshots help to get to know the geological past of Krasiejów, and the suggestive drawings show how most likely the rulers of these sites looked over 200 million years ago. The Dinopark is located approx. 1.5 km east of the center of Krasiejów, near the Opole – Lubliniec railway line. Access roads were well marked with appropriate signs. 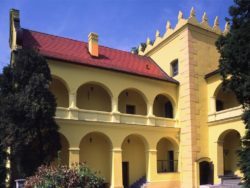 In the 13th century, Rogów belonged to the Knights Templar and they are credited with building first castle on a hill, above Odra valley. Reconstructed by frequently changing owners, the building currently has the features of a late Renaissance building, but most changes in its appearance were introduced in the 18th and 19th centuries. Count von Haugwitz was the hereditary property of Rogów. The castle was extended by them. He temporarily served as the main residence and center of management of goods transformed into majorat (in majorat the lands and all properties remain indivisible and are each time transferred to the eldest descendants of the owners). In 1865, Kurt Ulrich, Count of Krapkowice and Rogów, married a Danish princess. 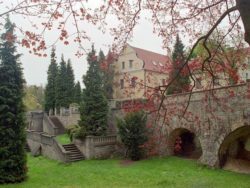 After the death of the last of the Silesian Haugwitz in 1931, the local castle became the property of the Danish representatives of the family. They enjoyed him briefly. In 1945, the residence, which was ruined during the war, was nationalized along with the farmstead. From 1965, the castle was taken over by the Provincial Public Library from Opole. Librarians have dealt with the renovation of the object and it must be admitted that they keep it in an exemplary order to this day. A branch of the library’s collections was placed in the castle halls. Medieval manuscripts (the oldest from the 14th century), antique books, valuable antique prints and maps are stored here. Luckily, the object was made available for tourists to visit. You can see an impressive fireplace room and rooms on the ground floor, where an interesting exhibition depicting the history of the magazine and the book was arranged. The world chronicles published in Nuremberg in 1493 mention, as the most important Polish cities, successively: Kraków, Wrocław and Nysa. The last of them was established in 1223 on the Flemish law, because the majority of the first settlers of Nysa were Flemish. In the years 1342-1810, Nysa was the capital of the duchy of the bishops of Wrocław and for many centuries the largest and the richest city of Silesia after Wrocław. Wonderful buildings, especially many rich churches (there were 12 of them), allowed to call the city “Silesian Rome”. The Old Town was also enchanted with Gothic and Renaissance tenement houses, some of which received a Baroque décor. In 1742, the city was taken over by the Prussians. The fortifications surrounding them that surrounded Nysa made it one of the most modern fortresses in Europe. The capture of Nysa in 1807 took the French for almost 4 months, with the fortress crew leaving stormed forts only as a result of the exhaustion of food and ammunition stocks. Nysa fortifications also served as a prison. Marie Joseph de Motier, known as the Marquis de la Fayette, who was famous for his participation in the American Revolutionary War, a co-creator of the Declaration of Human and Civil Rights, stayed here. During the First World War, Charles de Gaulle, later French marshal, was imprisoned in Nysa casemates. Despite the decision to liquidate the fortress (1877) and the serious damage caused by World War II, fragments of fortifications that can be visited are preserved in the city and its peripheries. The most interesting is the five-armed Fort Prussia built on the plan of the regular, located on the left bank of the Nysa. It is accompanied by embankments with bastions, and Forts I and II on the foreground. On the right bank of the river, the city is surrounded by the remains of older bastion fortifications and individual redoubts, flashlights and forts. In 1945, Nysa suffered serious damage. Today, its great splendor is evidenced above all by the huge 15th-century church of St. St. Jakub and Agnieszka. It was started to be built in 1198, but it gained its current Gothic form in 1424-1430. 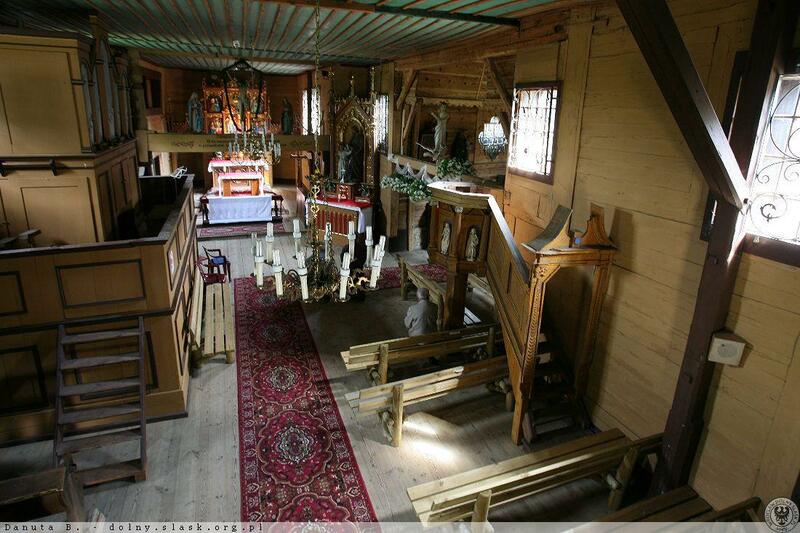 In the 17th century, there were 43 altars in its enormous interior! To this day only one valuable late Gothic triptych, currently in the main altar, survived. 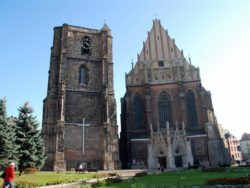 The peculiarity of the temple is the exceptionally numerous Renaissance and Baroque sarcophagi and epitaphs, commemorating the Wroclaw bishops buried here. From a distance, the castle in Moszna looks like a theatrical decoration. 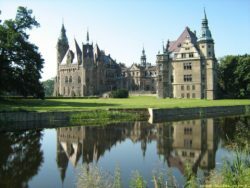 Built at the turn of the 19th and 20th centuries, it resembles with its architecture films by Walt Disney, in which each of the castles could have plenty of towers and other castle attributes to share a few real objects of this type. 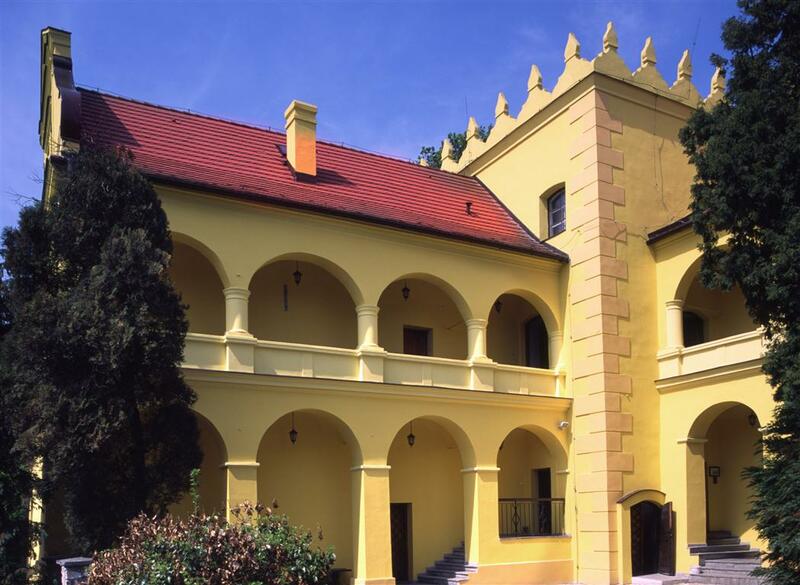 Similarly, the residence in Moszna contains several hundred percent of the “castle in the castle”. 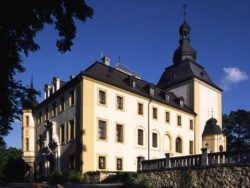 Interestingly, the building erected by the Prussian magnate of the mine and the wealthy landlord Hubert von Thiele-Winckler has never served as a defensive function. This is a magnificent palace residence, according to some, the level of architecture bordering on kitsch. 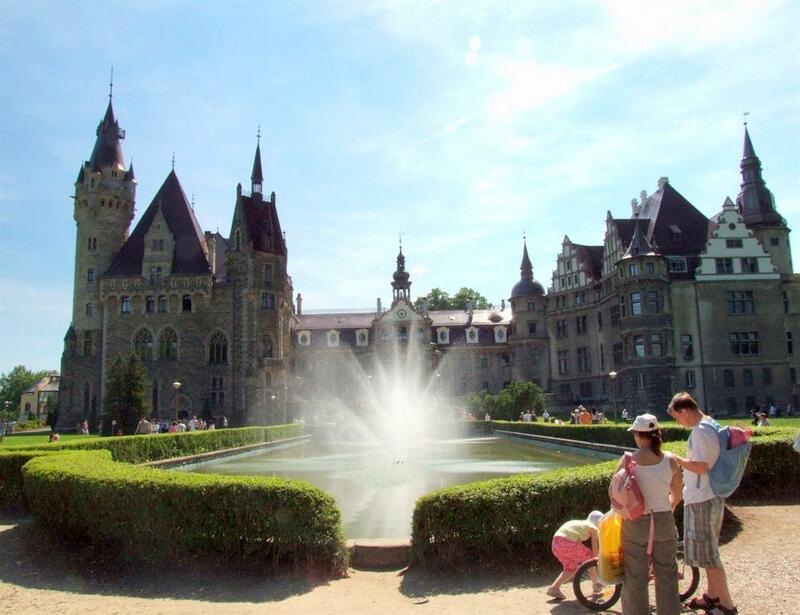 The castle has 365 rooms, and its silhouette is dominated by 99 towers and turrets. You can visit the magnificent interiors of the “white” and “black” salons, dining room and hunting room. Tropical, thermophilic plants grow in the palm house. The beautiful castle park with old azaleas and rhododendrons is worth a walk. From many places in the alleys you can take a good look at the intriguing architecture of the castle with towers. The right ones are those who think that the greatest impression in Moszna is made by combining the advantages of an unmatched residence with its green surroundings. The castle has a well-equipped facility of a public health care facility – Neurotic Therapy Center. 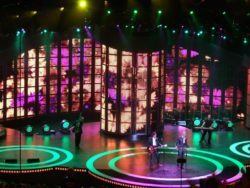 Every year in May, the Moszna Music Festival of Blooming Azaleas takes place. In the von Thiele-Winckler stables, since 1948, there is a famous stud where English thoroughbreds are bred. It also teaches horse riding and organizes rides and winter sleigh rides.